Parts of the Amazon rainforest may face less serious droughts this century than previously feared, according to new research. The Amazon is biologically the richest region on Earth, hosting a quarter of global species. Amazon rainforestScientists compared 19 global climate models with actual rainfall measurements for the region. The study found that the models tended to underestimate current rainfall levels because the models don't quite capture some of the peculiar features of the geography of South America. The models also "vary greatly in their projections of future climate change in Amazonia," according to the paper, published in the US journal Proceedings of the National Academy of Sciences. The research team was led by Professor Yadvinder Malhi from Oxford University and included climate modeller Dr Chris Huntingford from the Centre for Ecology & Hydrology, and Dr Stephen Stich from the Joint Centre for Hydro-Meteorological Research. Dr Huntingford and Dr Stich are both based at CEH’s Headquarters site in Wallingford, UK. 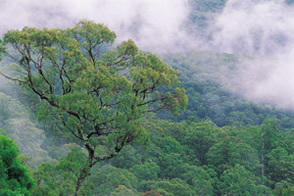 Some climate models have predicted that parts of the eastern Amazon will turn from rainforest to savannah this century. The new findings, with corrected rainfall patterns, suggest the region may move from year-long wet seasons to wet and dry seasons. This will result in a seasonal forest - not quite a rainforest, but, crucially, not savannah. Western Amazonia could remain a rainforest, while the findings suggest north and south Amazonia may dry out. 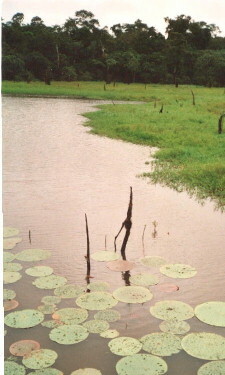 Amazon river with liliesThe drier areas will become more susceptible to fires, which are rare at present. Fire associated with deforestation, logging and fragmentation may trigger a transition of these seasonal forests to what is described as 'fire-dominated, low biomass forests.' The new research suggests eastern Amazonia could escape this fate if deforestation and fires are controlled effectively. Rainfall predictions remain a major challenge for climate models, which is why reducing uncertainty is a key priority for the research community. A previous study, published in 2008, indicated the possibility of a heightened risk of drought in the Amazon rainforest linked to reducing sulphur dioxide emissions from burning coal and increasing sea surface temperatures in the tropical north Atlantic. CEH scientists have a long history of research activities within the Amazon basin and also undertaking work to reduce uncertainty in rainfall predictions. CEH currently leads the Water and Global Change programme (WATCH), funded by the European Union, which brings 25 leading research centres in climate change and hydrological science together to study the global water cycle. The PNAS study was carried out by scientists from Oxford University, the University of Edinburgh, the Centre for Ecology & Hydrology, the University of Sheffield, and the Met Office Hadley Centre. The research was funded by the Natural Environment Research Council and the Jackson foundation. Proceedings of the National Academy of Sciences website (external link - subscription may be required to read full paper).